That’s right, the dinghy. And, the flag, true, but that’s attached to the davits (the steel arms) that hold the dinghy on the back of the boat. The difference is the dinghy. The damn dinghy. The source of our harrowing debacle. And I credit this title to a good friend of mine who, when I first told her this fine tale, which I lovingly called “the most exciting adventure of my life” (primarily because I survived it), claimed it sounded more like a ‘harrowing debacle’ than an adventure. Thanks Dottie. But, debacle or adventure, it happened. And, we all, thankfully, lived to tell the tale. So, we set out Sunday morning on a beautiful morning sail, headed to Apalachicola. The sun was out, the wind was blowing and the boat was performing beautifully. We felt like we had taken measures to ready the boat for the storm we knew we were going to face, and we were ready to get the passage behind us. We started to see squalls on the horizon around 2:00 p.m. The waves were 2-3 at the time and we furled the Genny and reefed the main sail (pulled it down so only about half the sail was exposed to catch the wind). The Bottom Line guys had put some distance between us earlier in the day, and we could no longer see them on the horizon, but we knew we could hail them on the radio at anytime if we needed to check in. We were just motoring along, holding our heading, bracing for the storm. 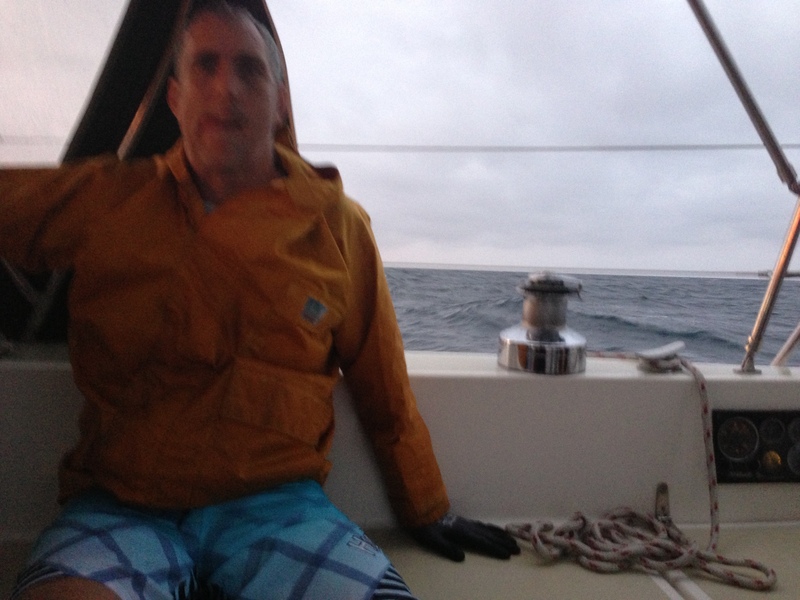 The wind picked up in the afternoon to 20 knots, and we dropped the main sail entirely and latched her down. 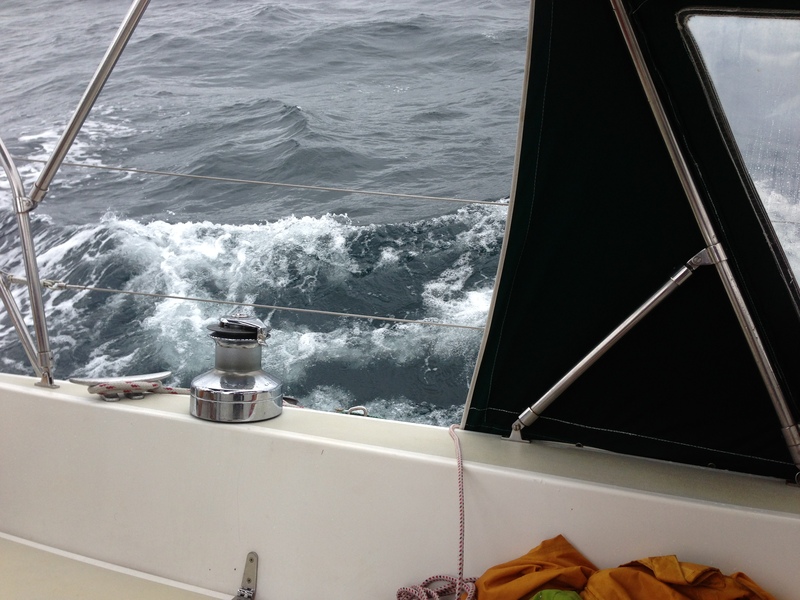 The sea state increased to 3-4, and the waves were hitting us broadside on starboard (the right side of the boat). And by that, I mean there was no way to turn into the waves to cut into them and ease the impact on the boat. Much like the red boat in this picture, but we were almost directly parallel to the waves. We were headed northwest and the winds were coming at us northeast. There was nothing we could do but let the boat heel to and fro over them. Graphic – boat heeled to starboard. Visual – boat heeled to port. And heel she did. Probably 50-60 degrees in each direction. Back and forth. For hours. I snapped a few shots trying to capture it, but the pictures just don’t do it justice. You have to really experience it to appreciate the sensation. Notice Phillip’s foot propped up on the portside of the cockpit, bracing himself. And, do also notice the Gorton’s Fisherman pants he’s wearing. The rain started late afternoon and spat at us all evening and into the night. 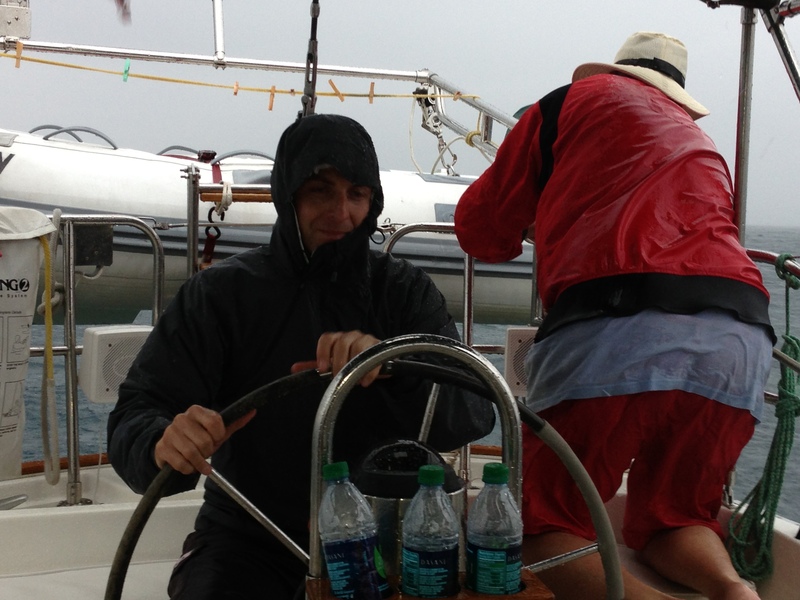 With the rain and waves splashing over the starboard deck, we were all getting soaked in the cockpit. So, we scoured the boat that afternoon hoping Jack had left some good wet weather gear behind, and boy did he! We struck gold with a complete Gorton’s fisherman outfit – big yellow hat and all. We each swapped and shared each piece of that yellow rubber suit – jacket, pants, hat and boot. When it came time to hold the helm, you could hear each of us holler at one of the other “Where’d you put the Gorton’s hat?” “I need the Gorton’s pants!” And, I think I heard at one point, “God, I love Gorton!” We certainly appreciated that dry, rubbery goodness. That stuff is for real. The waves kept coming and the rain stayed on us all afternoon. 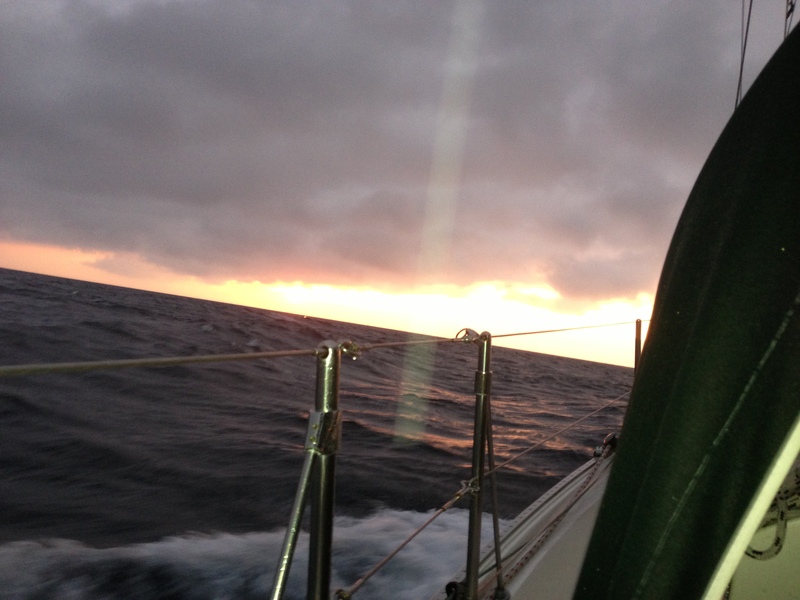 We were pruny and drenched and squinting out onto the horizon, only to see clouds, darkness and swells. We tried to hale the Bottom Line boys on the radio at one point to see how they were faring, only to find our radio had gone out. (We later learned only the handheld in the cockpit had shorted, due to the heavy drenching, and our main unit down below still worked once the hand-held was disconnected – but we certainly did not know that at the time). 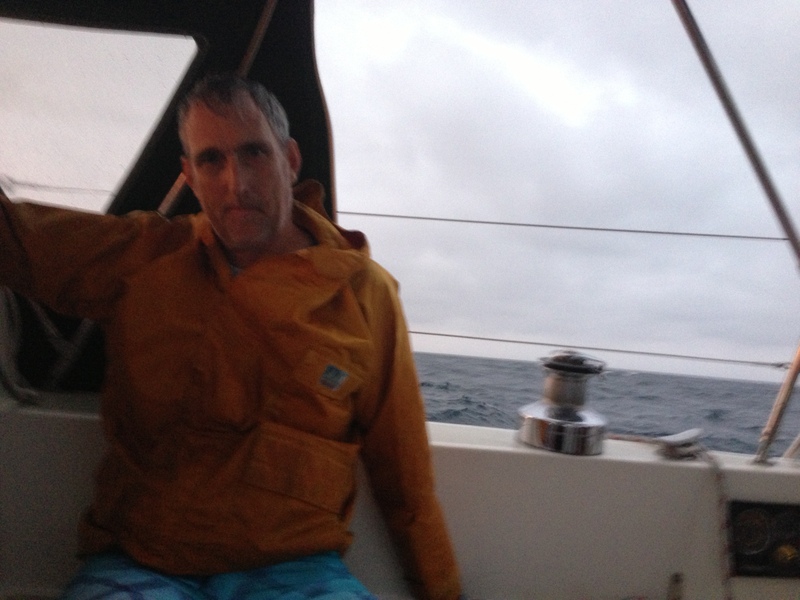 We were 150 miles offshore, in 4-6 foot seas with no radio. But our engine powered through and we pushed on, heeling left and right for hours. You could often look down and see the water was just inches away from the deck. At first, it was hard for me to believe every time the boat kicked over that it was, in fact, going to right itself. But, it did. It does. Every time. The boat always comes back up. 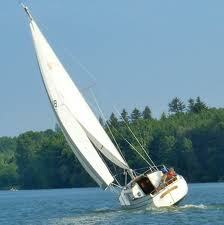 And, after enough heeling and righting, you start to develop limitless trust in the boat. No matter how far she heels over, you never believe for one second that she will actually tip. Not ever. 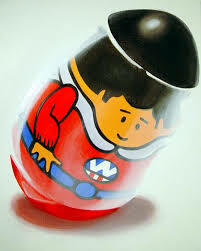 Like she’s a Weeble or something. We finally found his Dramamine tucked away behind some hidden zipper in his bag, and he dosed up. I noticed at the time the package said “non-drowsy,” but I’m here to tell you that was the not the effect it had on Mitch. But I’m getting ahead of myself. Mitch tossed his cookies just a few times. To his credit, he found himself a bucket and kept it nearby, trying to be a gentleman about it, but I kept coming across that dad-burn thing on the table, or the kitchen counter, splashing around and reeking with vomit. 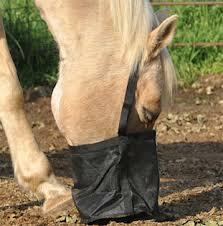 I wanted to tie it around his head like a horse with a feed bucket. But his meds must have finally kicked in, because Mitch perked up for a bit (probably just a placebo effect and mental fortitude) and sat up with us in the cockpit as we soaked up the last bit of daylight. 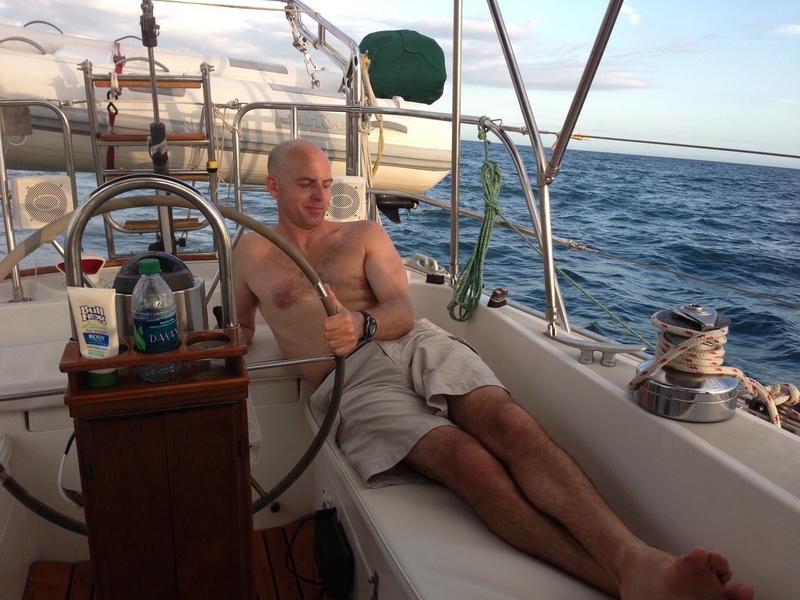 The waves were around 4-5 then, and our trusty captain held fast at the helm while we watched the sun set. As the last bit of light dipped below the horizon, a loud ping rang out of the cockpit. It was the same sound Phillip and I had heard on our last passage when we found the sheared bolt head. Phillip and I looked at each other knowing it had to be another bolt. But a deeper worry was the thought that it likely came from the same place. Some plate or bracket or other immensely-important fastening device on the boat was giving way. This time I didn’t look around the cockpit to find the bolt head that had flew to its watery death at our feet. We knew it was a bolt head. What was more important was where it came from. 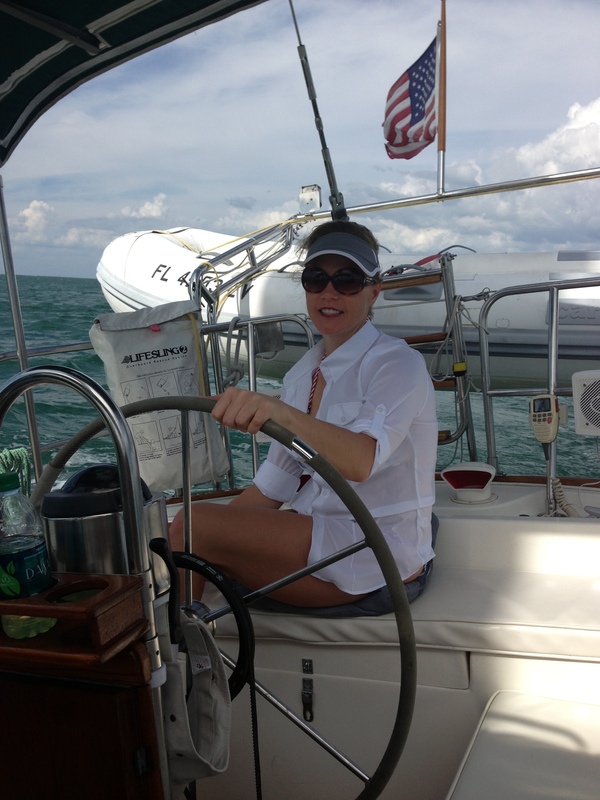 I immediately started looking around the cockpit again, at shackles and pulleys, the bimini frame, everywhere. But, the answer screeched out as us before I could find her. Just as the boat heeled hard to port against a wave, the davits on the stern rail screeched and the dinghy swung to the left and clanged. Here’s another shot of her portside from the day before. You can see the davit arm reaching out over the back of the boat holding the dinghy up, and the outboard motor (with the green cover) was attached to the dinghy as well. The dinghy itself weighed about 100-150 pounds, and the outboard another 150. We all stared at her for a minute, thinking the same thing: it was the davits, those stupid, frail, stainless steel little rods holding up the dinghy and the outboard motor on the back of the boat. But, it was as if we all wanted validation. 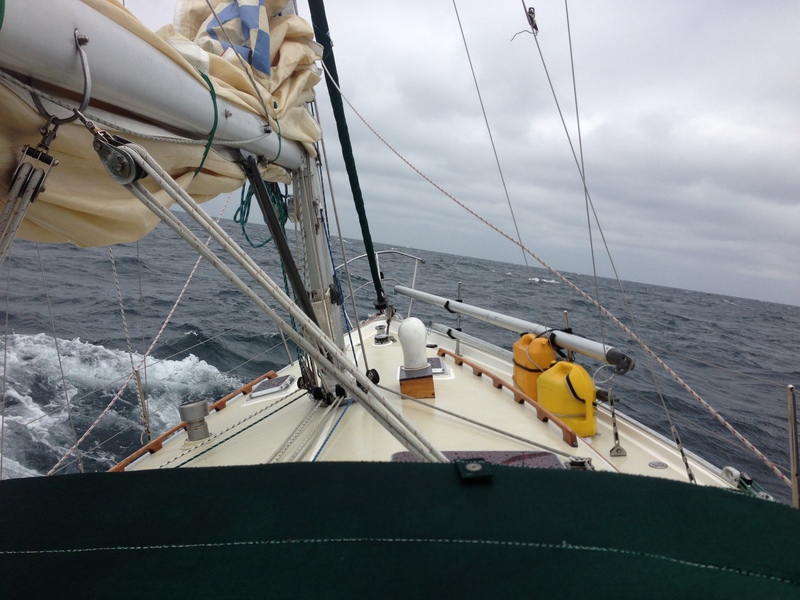 We waited in silence as the boat heeled to the starboard side and eased down the wave and another swell came toward us. The davits squeaked a bit and we could see the dinghy nudging its way back to the right, but when the next wave came and sent the boat effortlessly over to port, we all watched as the davit brackets on the stern rail slid visibly down the stern rail to port side. 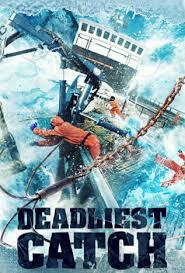 The davit arms swung to the left and clanged as the weight of the dinghy swung around. If we wanted validation, we got it. The davits were not going to hold. We examined the davit bracket on the portside rail and found, sure enough, two bolts on it had sheared through. This is the bracket the bolts were shearing off on, and by the end of it, it had slid about a foot to portside, almost around the corner of the stern rail. There were only two bolts left in the bracket. We began looking for spare bolts, all over the boat, to fill the holes but we couldn’t find one the same shape and size. We had brought a lot of spare parts for the passage: primary and secondary fuel filters, oil filters, impellers, gaskets, fuses, belts, etc. We felt we had really tried to think of everything that could possibly go wrong, but I have to say, replacement bolts for the dinghy davits just in case they started shearing through was just not something we had planned for. We got creative. We started filling the bolt holes with cotter pins for sails, allen wrenches, anything that would slide through and somewhat hold. We also started tying the dinghy with any rope available, trying to stop it from banging to port every time we climbed a wave. We are heeled to port baby! 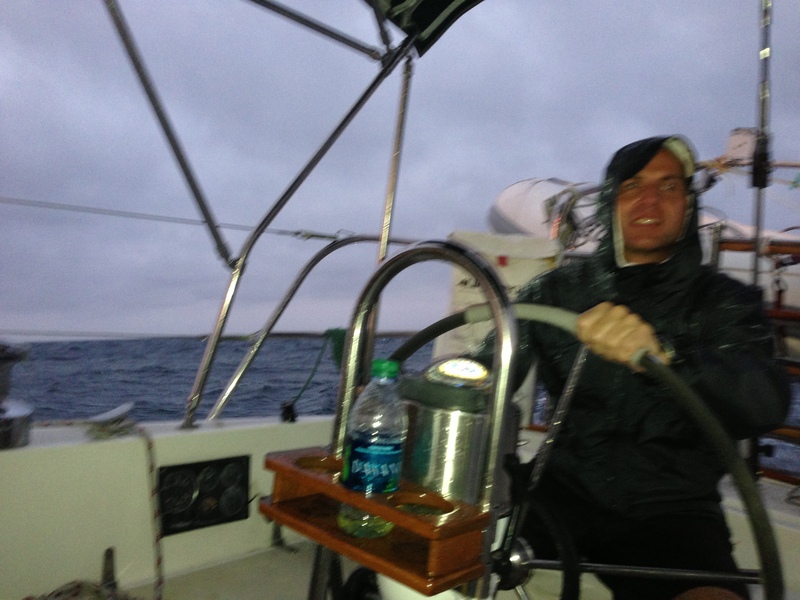 Phillip and I stayed up at the helm as darkness set in around us. The wind screamed as it passed over the mast and through the cockpit. It was blowing so hard it stung our eyes and made it hard to keep them open, particularly in light of the rain which, probably, without the wind, was only a steady dusting, but the gusts transformed it into pelting sheets. The sound of the waves against the hull and the groaning and creaking of the boat as she tipped mightily over each wave became far more prevalent, almost haunting, at night. As if our sense of sound was heightened. Think how much easier it is to hear a pin drop in a pitch black room as opposed to one brightly lit and full of visual distractions. Around 9:00 p.m., we heard our “pin” in the dark. Another bolt sheared off the davit bracket and pinged loudly in the cockpit. I would love to say Phillip and I shared a knowing glance. We certainly locked eyes and shared a moment, but I can honestly say I didn’t know he was thinking. I didn’t know what we were going to do. Thankfully, Phillip did. A resolve came over him, and he spoke in short, commanding sentences in a tone I had never heard from him before. He told me to go down and wake Mitch, which I did without hesitation. And, to Mitch’s credit, he woke instantly, shook off the nausea and came up to the cockpit. I’m sure he could tell by the tone in my voice as well that things had changed. We were in trouble, and there was no time for sickness. We all sat in the cockpit, looking to Phillip. He told us he thought the davits would eventually give out and the dinghy might take us down on port side. We had to be ready to cut it off if that happened. Neither Mitch nor I questioned him. There was no need. We agreed. Altogether, the dinghy and outboard weighed about 300 pounds. If that thing hit the water, it would easily pull the boat to portside, and with the way we were already heeling over waves, we couldn’t afford any “pull” to the left side. We also had no way to pull her out of the water. Wrestling 300 pounds up over the stern rail and onto the boat was not even a possibility, much less an option. Nor was there anywhere to safely store the outboard motor (which was full of gas and oil) safely on the boat while we rode out the storm. There was also a real concern that the dinghy could rip the entire stern rail off or, worse, rip a hole in the deck where the stern rail attaches, making sinking not just a possibility but a probability. There was no denying it. The dinghy had to go. Phillip gave me the helm while he and Mitch went down below to round up anything we could use to cut the lines: knives, box-cutters, a hacksaw, anything with a blade. We lined them up like surgical utensils on a tray near the companionway. The davits continued to screech each time we heeled to port and the dinghy banged loudly as her weight swung around. We knew it wouldn’t be long. I bit down hard, clenched my teeth together and began sawing the electrical cord. A few more sparks flew, but thankfully, nothing ignited. Apparently, the cord was the last thing holding the dinghy on, because when the hacksaw finally made it through the last of the rubber and wire, the dinghy crashed violently in the water and began, finally, to pull away from the boat. Lines were dragging helplessly from the back of the boat and, thankfully, Phillip had the fortitude to still think clearly in that moment. “Get the lines in!” he yelled at us, knowing they could get caught in the propeller and put us in more danger. Mitch and I snapped to attention and grabbed lines viciously, throwing them into the cockpit with reckless abandon. We hit Phillip with several of them but he didn’t say a word. 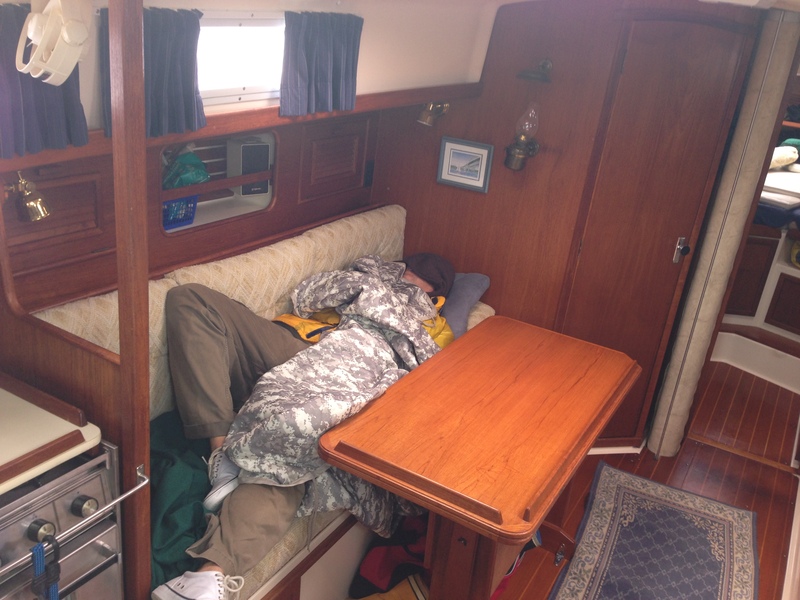 He hunkered down, held the wheel and steadied the boat while Mitch and I pulled in the last of them. Afterward, we all fell into a heap in the cockpit, drenched and shaken, but feeling more alive in that moment than we had the entire trip. I doubt Mitch could even comprehend nausea at that moment. Our bodies were feasting on adrenaline. We sat there, our chests heaving in unison it seemed, gathering our thoughts and wondering if what just happened had really happened. Phillip shined a light out into the sea as it to confirm our collective inquiry and there it was. The dinghy. About 50 yards away from the boat, lines floating around her like spindly fingers reaching back for the boat. She was truly out there, detached from the boat and floating away. We had really done it. Cut her off. The damn dinghy. The boat breathed a sigh of relief as if she had just finished a forty-mile march and finally set her rucksack down to air her sweaty back. Her heeling back and forth was now graceful, soothing almost, and we all finally appreciated how much she had been struggling with the dinghy on her back. We breathed with her, equally relieved, but our faces were still heavy with worry. We were hundreds of miles from shore, in the middle of the Gulf of Mexico, in the middle of the night, without a radio, and, now, without a dinghy. And we were only half-way there. This entry was posted in Gulf Crossing, Sail Skills and tagged 2-3 foot seas, cut off the dinghy, davit arm, davits, deadliest catch, dinghy, gorton's fisherman, gulf crossing, heeling, offshore, reefed the main, sea-sick, stern rail, weeble. Bookmark the permalink. Oddly, I got a really sad feeling for the dinghy as it floated away – same way I felt about “Wilson” in Cast Away. I think it seemed “alive” to me while you were cutting the electrical cord. The sparks were like its last drops of life flashing in a helpless attempt to protest its abandonment, but then disappearing when its fate became inevitable. What happened to it, anyway? Is it still floating aimlessly in the Gulf of Mexico? Will it be picked up and adopted by some other sailors? Did it sink? I’ve decided I need closure on the dinghy. Closure on the dinghy, huh? I agree. We would like some closure, too. But, alas, it seems the Rolling Stones were right – you can’t always get what you want. I felt a bit sorry for it too, floating away in the darkness. It hadn’t done anything wrong, but we cut the finger to save the hand. We haven’t heard anything further on it yet. It is registered to Phillip, and we reported it to the Coast Guard so if it turns up and someone tries to re-register it, it should be reported to us. But, as of yet, we haven’t heard a thing. I can only hope some shipwrecked soul and his tiger came upon it and made a new home. WOW Annie – you are quite the writer!!!! Thank you for letting us know your ups and downs and that you are safe!!! Good luck my friend. Thanks Marie! There certainly have been some peaks and valleys. Or, peaks and troughs I should say, but every moment has been worth it. We’re eager to get back out there on blue waters; hopefully, this time, in better conditions. So glad to have you following along. Stay tuned! Were you still motoring while you were cutting the Dingy lines? If so, why didn’t you stop and kill the engine while you were taking care of the dingy? Hey Ricardo. Glad to have you on board! The short answer? 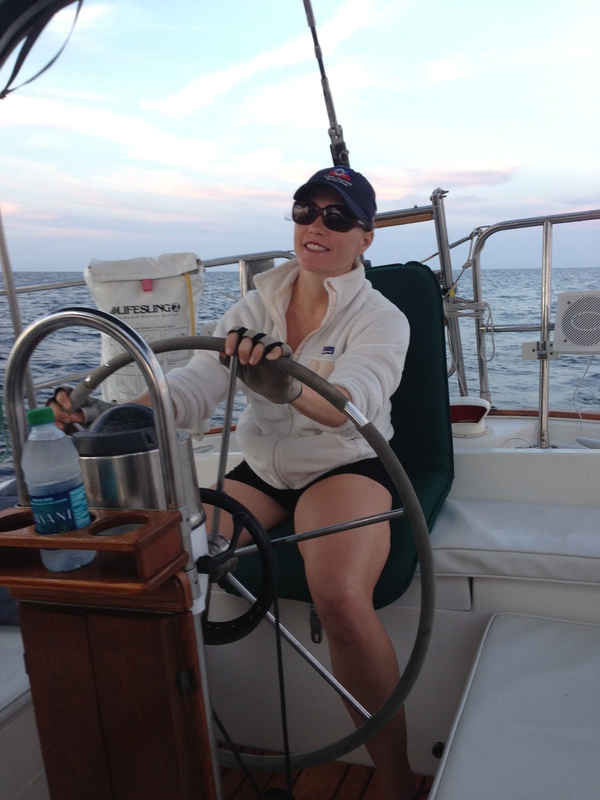 Because we were newbie sailors making a rookie mistake – ha! I’m kidding. Phillip was definitely the most experienced out of us but this was definitely a new situation for him. 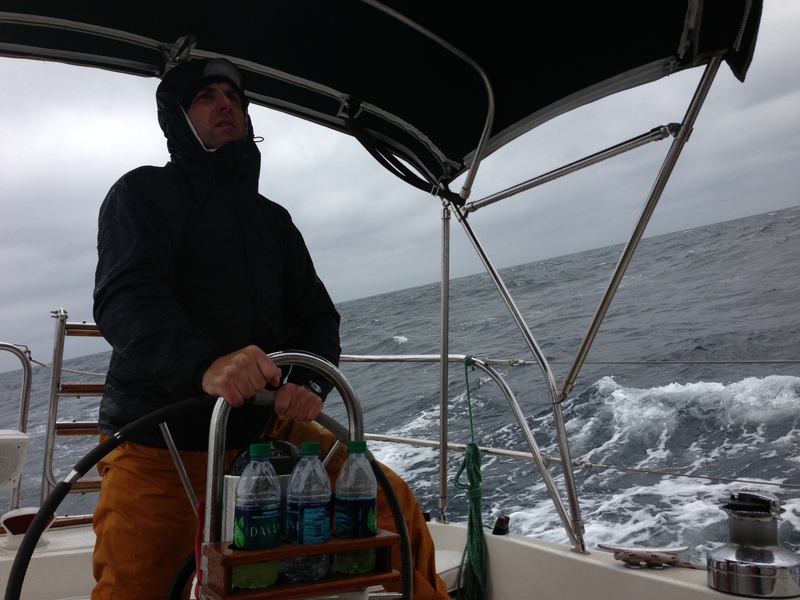 The sea state was so bad he felt he needed to keep motoring to keep momentum forward and control of the boat. In hindsight that might not have been necessary and we didn’t foresee the “lines in the water” problem until about halfway through the cutting. It was utter chaos. I can’t say we did everything right or entirely wrong, but at least we survived it — minus one dinghy. Glad to have you following along!